Thematic reports published annually by the United Nations Development Progrramme (UNDP). Recent themes have included; The Real Wealth of Nations, human mobility and development, climate change, and the global water crisis. The site also provides access to thematic regional reports. The OECD online library contains over 5000 e-books, 2 900 working papers, 2 500 multi-lingual summaries, 400 statistical datasets and 2500 working papers. Business Source Complete features country reports from publishers such as Business Monitor International, IHS Global, and Marketline (formerly DataMonitor). Published by the Library of Congress, these country studies are an excellent source for country histories. Data and analysis that measures the business environment of more than 180 countries and selected cities around the globe. Data on more than 4000 infrastructure projects for 137 developing countries. Select the "Get Data" tab in the center of the page to view pre-defined reports or build custom reports by country and sector. Build custom reports on infrastructure privatization for developing countries. The site includes a unique feature that lets you map the transactions on a global scale. Data and analysis on railway & private concessions and private participation in transport infrastructure. Also provides access to the Logisitics Performance Index which monitors the trade logistics performance of countries around the globe. First published in 1995 by Transparency International, the Corruption Perceptions Index measures observed levels of corruption within a country. To view corruption/transparency data at the country level, see this link. A World Bank resource that measures six dimensions of governance: Voice and Accountability, Political Stability and Absence of Violence, Government Effectiveness, Regulatory Quality, Rule of Law, Control of Corruption. Data are available from 1996 - present for over 200 countries. A major collection of business journals covering topics such as management, economics, finance, accounting, and international business. Content includes general business magazines like The Economist, academic journals such as Harvard Business Review, as well as industry reports and country reports from the Economist Intelligence Unit (EIU). See video below on how to search Business Source Complete. Most industry databases use Standard Industrial Classification (SIC) codes to organise their data. The classification provides a framework for the collection, tabulation, presentation and analysis of data, and its use promotes uniformity. Data on household consumption patterns in developing countries. Select data by country and sector. Type ECST into command bar. Under Functions choose ECST World Economic Statistics. Choose a country (in this case type and select Spain) in the amber- coloured field. Choose Labor Market. In the centre of the screen find datasets available on this subject. Click on any dataset name for more detailed data. Click on the Graph icon to the right of any dataset(s) to create a chart. Change date range etc. as required. Alternative: create chart as above, choose 7 Workbench above the chart. Use red tab 2 Export to export chart or data. Type GBPEUR into command line. Under Securities, choose GPBEUR Curncy. Choose GP Historical Line Chart. Change date and frequency (= period) as required. Right click chart, choose Copy/export options, Copy data to clipboard. Paste data into Excel. 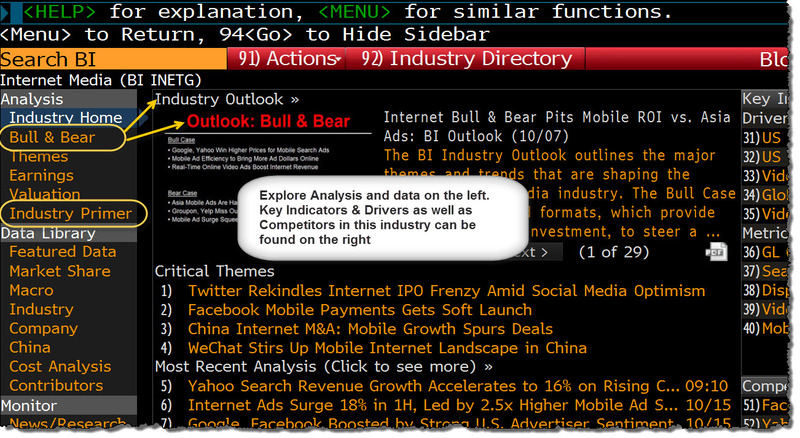 Bloomberg can be searched by keywords and menus, but it is often more efficient to use Bloomberg mnemonic shortcuts and the color-coded keyboard for various functions. These basic instructions will get you started. Use the built-in Guides for more detailed searches. The Industry Analysis page provides information and data on industries, including overviews like Bull-Bear Outlook an Industry Primer, detailed analysis, e.g. Valuation of peer groups, and multiple other tools for analysis. You will be able to identify the ones with Bloomberg installed by the keyboards. 1. How do I search for a company by name? 2. How do I use the graphing function? G <GO> then choose 1 <GO> to create a new graph. Follow instructions to set-up a graph. 3. How do I find Exchange Rate information? You can click on the historical pricing option in the company’s menu. Top tip – you can export all the Historical Pricing information from the GP menu by right clicking on the graph and selecting export data to excel. 5. How do I find a list of bonds from around the world?